Fremont County is part of the Rexburg, ID Micropolitan Statistical Area, which is also included in the Idaho Falls-Rexburg- Blackfoot, ID Combined Statistical Area. According to the U.S. Census Bureau, the county has a total area of 1,896 square miles (4,910 km2), of which 1,864 square miles (4,830 km2) is land and 32 square miles (83 km2) (1.7%) is water. The southern part of the county cover the northeast tip of the Snake River Basin, with the mountains of the continental divide forming its northern boundary. Montana lies to the north, and Wyoming to the east. A portion of Yellowstone National Park reaches into the county. Fremont County is one of the few US counties to border two counties of the same name in different states. Fremont County borders two such pairs of counties-- Madison County, Idaho and Madison County, Montana and Teton County, Idaho and Teton County, Wyoming. There were 3,885 households out of which 39.50% had children under the age of 18 living with them, 67.90% were married couples living together, 6.90% had a female householder with no husband present, and 22.00% were non-families. 19.50% of all households were made up of individuals and 8.50% had someone living alone who was 65 years of age or older. The average household size was 2.96 and the average family size was 3.43. In the county, the population was spread out with 33.10% under the age of 18, 9.30% from 18 to 24, 24.70% from 25 to 44, 20.40% from 45 to 64, and 12.40% who were 65 years of age or older. The median age was 32 years. For every 100 females, there were 105.80 males. For every 100 females age 18 and over, there were 105.80 males. The median income for a household in the county was $33,424, and the median income for a family was $36,715. Males had a median income of $26,490 versus $19,670 for females. The per capita income for the county was $13,965. About 10.30% of families and 14.20% of the population were below the poverty line, including 18.40% of those under age 18 and 13.60% of those age 65 or over. ^ a b "State & County QuickFacts". United States Census Bureau. Archived from the original on July 10, 2011. Retrieved June 30, 2014. ^ Idaho Atlas of Historical County Boundaries. Chicago: The Newberry Library. 2010. pp. 27, 63, 74, 87–91, 115, 139, 188. ^ "Fort Henry Monument". idahoheritage.org. Retrieved 15 February 2017. ^ "Fur Trade Posts in Idaho" (PDF). 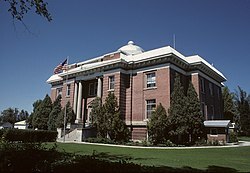 Idaho State Historical Society. Archived from the original (PDF) on 2017-02-04. Retrieved 15 February 2017. ^ "Island Park and Its People". Fremont County, Idaho. Retrieved 15 February 2017. ^ Report on the Population of the United States at the Eleventh Census: 1890 (PDF). 1895: Government Printing Office. p. 99. Retrieved 15 February 2017. ^ "History of Warm River Idaho". Snake River 4 x 4. Retrieved 15 February 2017. ^ Encyclopedic History of the Church of Jesus Christ of Latter-day Saints. Salt Lake City: Deseret News. 1941. pp. 482, 582, 639, 868. Retrieved 15 February 2017. ^ "Full text of "History of the uplands, Farnum, Drummond, Squirrel, Lamont, and communities faded into the past, 1896-1990 : history of homesteading and pionering[sic], histories of families by contribution, and special permissionof articles from the "Snake River Echoes". archive.org. Retrieved 15 February 2017. ^ "U.S. Decennial Census". United States Census Bureau. Archived from the original on May 12, 2015. Retrieved June 30, 2014. ^ "Historical Census Browser". University of Virginia Library. Retrieved June 30, 2014. ^ "Population of Counties by Decennial Census: 1900 to 1990". United States Census Bureau. Retrieved June 30, 2014. ^ "Census 2000 PHC-T-4. Ranking Tables for Counties: 1990 and 2000" (PDF). United States Census Bureau. Retrieved June 30, 2014. ^ "Ancestry of the Population by State: 1980 - Table 3" (PDF). Retrieved 2012-02-10. ^ Stanley Lieberson and Lawrence Santi, 'The Use of Nativity Data to Estimate Ethnic Characteristics and Patterns', Social Science Research, Vol. 14, No. 1 (1985), pp. 44-6. ^ Stanley Lieberson and Mary C. Waters, 'Ethnic Groups in Flux: The Changing Ethnic Responses of American Whites', Annals of the American Academy of Political and Social Science, Vol. 487, No. 79 (September 1986), pp. 82-86. ^ a b c "DP-1 Profile of General Population and Housing Characteristics: 2010 Demographic Profile Data". United States Census Bureau. Retrieved 2016-01-09. ^ "Population, Housing Units, Area, and Density: 2010 - County". United States Census Bureau. Retrieved 2016-01-09. ^ "DP02 SELECTED SOCIAL CHARACTERISTICS IN THE UNITED STATES – 2006-2010 American Community Survey 5-Year Estimates". United States Census Bureau. Retrieved 2016-01-09. ^ "DP03 SELECTED ECONOMIC CHARACTERISTICS – 2006-2010 American Community Survey 5-Year Estimates". United States Census Bureau. Retrieved 2016-01-09. ^ Leip, David. "Dave Leip's Atlas of U.S. Presidential Elections". uselectionatlas.org. Retrieved 2018-04-04.